There's not much colour left in my garden. A few stalwart leaves cling to mostly bare branches. The barberry bush is one example. I took these photos a few days ago and glanced outdoors to compare - there are far fewer leaves today. 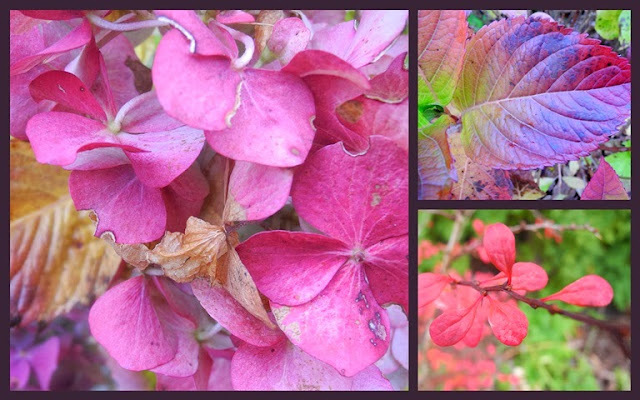 Rich pinks are in evidence on both the lingering hydrangea blossoms and their leaves, albeit somewhat battered looking. The kale plants are green as green can be. We've had a few light frosts and I've heard that the cold will sweeten kale. We'll be harvesting until early spring when it's time to plant again. Carrots, seen in the corner, can stay in the ground most of the winter, too. I harvest a row or so at a time. There's always something of beauty to be found isn't there? Sadly the snails ate all our kale before it had chance to really get started so I am a wee bit envious of your healthy looking plants!! There is beautiful colour in your collage Lorrie. And how nice that you can eat fresh carrots all winter long! You`re fortunate to be able to enjoy the harvest season throughout the upcoming months, Lorrie. my garden is mostly bare too. There's something quiet and peaceful about a fall garden, and I like taking a rest from gardening too. Those leaves may be battered, still they are so beautiful. Your adventures in kale and carrots makes me wonder how long into the season I might be able to grow them here. What pretty purple shades! Beauty, even in November! Love the colours in the mosaic, and kale is my new salad green. I tried growing some in a pot but it stayed very short. Do you cook yours, or eat it as a salad green too? Such a lovely, perfect pink! Oh that is so neat that you can have these fresh veggies all winter. I wonder if that is possible here? I've never heard of it anyway. Ah...well mine can stay in the ground too, if I like frozen carrots, lol. My poor swiss chard looks like it's a goner, but then -6 will do that to most plants. Here's to your snow that you are hoping for, be more then happy to send you some in February when I can't stand the sight of it, and you are counting snowdrops. Well in a nice way of course. Your winter garden is looking lovely. I haven't even checked mine out since we returned home! Such pretty colors. I love the thought of harvesting carrots all winter. It must be nice to be able to have fresh kale whenever you wish, Lorrie. That's nice you have carrots for so long, and kale too. The colors are muted but that is fall looking!